As the nation continues to embrace cell phone bans while operating moving vehicles, some states have already imposed bills that seemingly extend the ban to bicyclists. In California last year, the state passed a bill that dishes out fines to bicyclists caught using their cell phones – much like any motorists out there. However, lawmakers in the state are now trying to extend the same bill for another 3 years, but this time around, the fines associated with it would be slightly lower. Essentially, first time offenders will be slapped with a $20 fine, but then it would go up to $50 for each subsequent violation. Apparently, it seems as though the ban is making some headway seeing that a survey conducted by the Automobile Club of Southern California found that 60 percent fewer drivers use their devices since the law went into effect in 2008. Albeit, it’s still not yet known how it’s affecting bicyclists – but nonetheless, it’ll make anyone think twice about it. Kudos. 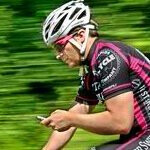 While less likely to be fatal to others, riding a bike distracted is a danger to yourself and others. Yes, but just riding a bike period is dangerous to yourself and potentially others?...soo, to me, this is just an overbearing law. What's next, not having proper biking attire? Without elbow pads, you 'could' fall down and bump your elbow!?! No, it's a danger because careless bikers are swerving all over the road, and they could be taken out in an instant by a car passing by. STAY in your lane...bikers. As stated by Brad a distracted biker can swerve in front of a moving car, cross in front of a car at an intersection, hit a pedestrian, etc. All these things can happen anyway, but when distracted you're much more likely to do it. If someone texts you or calls you come to a stop and take care of business, or do what I do when I'm driving. ignore your phone until you pull off the road. I knew that it was just a matter of time before something like this were to effect bicyclists. I live in WA and as far as I know they haven't made a law like that, but I do know that they will stop a bicyclist for speeding and not using hand signals. Next thing we'll know, bicyclists will have to get a special license and insurance to be able to legally ride our bicycles. It's sorry but these laws are put in place to protect people from themselves. I love to ride a bicycle because of the low impact & the cardio it provides. If my phone rings I stop and answer it. I can see people fumbling with the phone & getting hit a car. It's silly but because of some goofball who kills himself I now have to adhere to a new law. I see why this is being done, it's just sad that this is even happening. Really? The same thing can happen if you're fumbling with your ipod (music device) changing a song or whatever. Should the make a law for that was well? I am all for personally safety and all. But when does it go too far.